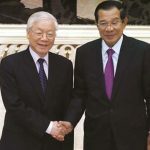 Cambodian Prime Minister Hun Sen’s official Facebook page was hacked on Monday, Facebook said a day later. 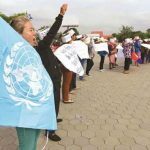 Cambodian demonstrators gathered outside the centre of Phnom Penh to commemorate International Human Rights Day yesterday, after authorities prohibited a march through the capital’s streets, a local rights organisation said. In a move to prevent protests around the home of Cambodia's main opposition leader Kem Sokha, police have formed a task force to monitor him, media reports say.